Milo lives with his adoptive parents in a smuggler's inn in the seaside town of Nagspeake. One Christmas holiday, when Milo and his parents usually have the place to themselves, not one, not two, but five visitors arrive late in the middle of a winter storm. All are shocked to find they are not the only guests staying at the Greenglass House that week, and Milo quickly realizes something fishy is going on at the inn. 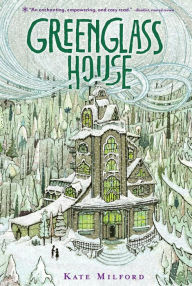 After he finds a map in the snow, dropped by one of the guests, and a string of thefts begin, Milo along with Meddy, the only child visiting the inn, take on a role-playing game and begin investigating the house and its visitors. And maybe learning a little about what happened there many years before and how it relates to their own pasts. From the first pages, the writing, the world, and Milo and his parents pulled me under the spell of the book. Right away, the setting establishes a cozy yet mysterious tone, and then when the real mysteries begin to crop up and compound, they entranced me further and made me wonder what was going on, what strange event would happen next, and what it all meant--from the stolen items themselves to the creaking floorboards of the house at night, unexplainably moved furniture, items turning up in odd locations, Chinese symbols marking specific objects, and the peculiarities of each of the guests and their stories. The house itself is intricately detailed and fascinating, and I loved exploring it with Milo and Meddy. One of my favorite elements of the house is the staircase. On every landing is a stained glass window, each one with different shades and colors and each one with the image of a gate hidden within it that Milo discovers is a clue to the house's history. Milo and Meddy spend many heart-stopping moments on the staircase, climbing to the attic to investigate for clues, hiding from sneaking guests, escaping traps, and overhearing puzzling conversations. In contrast, I also loved the coziness of the main floor with its fireplace, Christmas tree, and kitchen, where Milo's family and the guests often come together and share stories, meals, and hot cocoa and also bicker, scramble with candles during a blackout, and even cheer each other up in the most unlikely of ways. At first, the ending left me just a little disappointed with a few of the elements used to explain certain mysteries, though it was also intriguing and satisfying in many ways. This is a fun one to read a second time to pick up on all the sneaky clues the author leaves throughout the story to support the ending. I would also say that reading it the second time--already knowing the end, rather than having expectations--allowed me to appreciate the outcome more and how everything built up to it. A very sweet story with just the right amount of eeriness. Very beautiful, exciting, yet meaningful read. It would be especially fun to enjoy during the holidays. What are your favorite mystery stories? I like it when some mystery gets weaved in with a story too. :-) This one is mystery and fantasy. A fun mix! I love Agatha Christie! And actually this book reminded me of her a little bit.